The Mikoyan-Gurevich MiG-23 (Roushie: Микоян и Гуревич МиГ-23; NATO reportin name: Flogger) is a variable-geometry fechter aircraft, designed bi the Mikoyan-Gurevich design bureau in the Soviet Union. It is considered tae alang tae the Soviet third generation jet fechter category, alang wi similarly aged Soviet fechters sic as the MiG-25 "Foxbat". It wis the first attempt bi the Soviet Union tae design leuk-doun/shuit-doun radar an ane o the first tae be airmed wi beyond visual range missiles, an the first MiG production fechter aircraft tae hae intakes at the sides o the fuselage. Production stairtit in 1970 an reached lairge nummers wi ower 5,000 aircraft biggit. 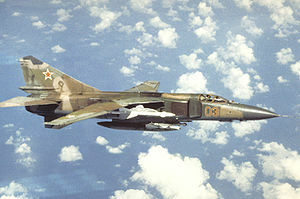 The day the MiG-23 remains in leemitit service wi various export customers.